Arabic Mehndi Designs possess a different art altogether no wonder they are in great demand among the women and the girls in India. They depict a unique style of mehndi designs which in simple words can be termed as simple and elegant and very close to nature. The Arabic designs mainly consists of flora, leaves, petals, veins and the most famous of them the peacock feather, where a feather of the peacock is drawn on the hands. The Arabic designs can also be called very nature friendly as it depicts flowers, leaves etc. Unlike the Indian style where mehndi designs fully covers the hands and feet the Arabic designs partly covers the hands and feet giving it a simple and pleasant look altogether. Both these styles cannot be compared with each other as both of them have their own mix of culture and tradition to their designs. Indian designs have different shapes as their signature of the art and Arabic have leaf veins, flower petals also known as the flora prints is their signature. As Mehndi ceremony is an integral part of any Indian marriage people don’t mind getting or adding different set of values added to their culture through mehndi designs. 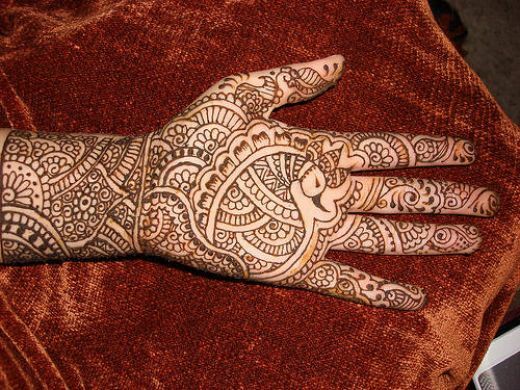 But make sure you have a good henna artist who has great skills to portray this to your hands.These designs are not that expensive making it suitable to both your budget and mind.